Also Recommended: Kino's Journey is a better and smarter travelogue, while Gurren Lagann and Punch Line do manic far better. Notes: This is an original series, directed by Kotomi Deai and written by Yasuyuki Muto. Although two different manga ran prior to the series' airing, pre-production of the TV series started before they were drawn, and so they're better described as being based on the TV series rather than vice-versa. The official title for this series includes the figure of a star between the two English words, but unfortunately, that isn't reproducible in this site's fields. In the near future, Japan no longer exists as a country: in the wake of the "Great Tokyo War," the loss of its economic and political elite put the country in chaos until it was eventually broken into city-states. The vigilantes who fought in this war, known as mosa ("bests"), now defend their individual city-states; in Tokorozawa, Nozomi Moritomo is a close friend and, functionally, the younger sister of Masami Utoku, a "best" from their town. After Masami is badly injured, however, Nozomi and three other non-"bests," Ai, Chiaya, and Yukina, are sent out on a sort of peacekeeping mission: increasingly, the city-states are coming into conflict, and without Masami, their city is at risk. 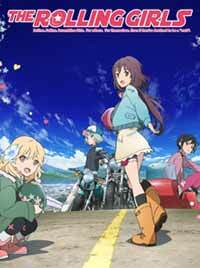 Our friend Jason Huff of The Anime Review calls Freedom a rare example of an anime whose middle section outshines a "shaky beginning and ending," and while 2015's The Rolling Girls might have little else in common with that show, the two share that same basic problem. To look at this show cynically, it's yet another entry in the flood of series trying to capitalize on the success of Kill La Kill and Hiroyuki Imaishi's busy and frantic style in general, but that's not completely fair to it. After it gets past a confusing opening arc full of info-dumps and boring battle sequences, it turns into an entertaining and visually fascinating travelogue of sorts, if not an especially well-written one, whose image of Japan-as-city states reminds me somewhat of the fascinating variety of towns seen in Kino's Journey. It's a shame that the show ultimately goes out on a mess, but for a while, it works well in spite of its own flaws. The visual style of The Rolling Girls might best be described as "florid," in both a literal and figurative sense, for the world seen in this show is one of many, many colors. We have the psychedelic palette seen during the series' gloriously upbeat OP (a cover of The Blue Hearts' punk anthem Hito ni Yasashiku), the myriad of outlandish clothing and hair accessories that make the cast, overall, look like audience members at an alt-rock-themed festival, and the variety of distorted and strangely constructed buildings seen in the girls' travels to the different cities. The Rolling Girls is a visually busy show, overall, and while the detail in the art ultimately looks cool more than it adds to the story or the background, it does keep the show interesting. Also, given that so few anime touch on regional differences across Japan, the varied architecture was a nice touch. The animation isn't as consistently good, however. As bored as I was by the fight scenes in the first two episodes, that had more to do with the show's doing a rush-job of explaining itself than their looking bad; in contrast, the fight scenes at the very end of the show are bogged down by pans and awkward transitions that manage to make these scenes even more boring and confusing. Between the two ends of the show, there are several episodes where the character models seem suspect, but one of the arc finales also features one of the best choreographed animated concerts I've ever seen, where a geisha-in-training and a female punk rocker duet on metal shamisen and guitar (respectively) as giant cannons fire at exploding Buddha statues. If that sounds awesomely ridiculous, it is, and it's a shame that not every episode of the show lives up to that standard. Still, the production is probably the strongest aspect of The Rolling Girls. This wasn't a show whose beginning made me feel optimistic, since the opening pair of episodes is a rushed introduction that attempts to describe as much of the backstory behind this vision of Japan-as-city-states as possible, while awkwardly sharing space with a series of mind-numbing battle sequences between Masami and a marauding bandit. We learn a little bit about how this Warring States version of Japan all came to be, but much of it occurs via a lengthy monologue that tells us about far more than we actually see. These long and drawn-out sequences don't accomplish much, meanwhile, besides convincing Nozomi that she needs to travel around the former Japan in order to make herself stronger and not rely on Masami so much, and while it's a noble cause, it's not one that two entire episodes out of a twelve-episode series needed to be spent on. I'm again finding myself comparing this series to the much better Kino's Journey, which launches into its own travelogue almost immediately and makes the smart choice of placing pieces of backstory throughout the series: it trusts its own vignettes to be strong enough, and it trusts the viewer to not desperately need to be spoon-fed everything at the start. The Rolling Girls, in contrast, spends far too much time trying to justify its premise, but it doesn't even manage to give a very accurate picture of what kind of show it will be. And it's a shame, because while I almost gave up on the series after those two episodes, it's a fun and silly romp once it gets going. The four main characters, surprisingly, aren't actually very active in the story, and at times they feel like spectators in their own show; this is, however, counter-balanced somewhat by the stronger supporting characters seen in each of the towns, with the best arc being focused on the musicians I mentioned earlier. Yes, it's the standard story about two former friends, on now-incompatible paths of life, realizing that they don't need to share the same worldview to be friends. But combined with the animation of the rock concert, some silly but amusing antics on the part of a yakuza gang trying to stop the festival from progressing, and the overall imaginative touch of Kyoto (where it is set) as the merging of a very classically Japanese city with the modern culture of constant rock festivals, it works; I'm sure the creators of K-On! appreciated the last aspect. Another strong arc centers around the wayfaring daughter of a Shachihoko maker finding her own passion in following her family's craft, rather than doing so out of blind filial piety, amidst a bicycle race-off between rival gangs that is (somehow) reliant on the presence of a shachihoko to even happen. Yes, it's just as absurd as it sounds, but it works. I didn't love every aspect of these middle arcs, but as a light-hearted and pretty-looking romp through a world where modern and classical Japanese culture blend in fascinating ways, it works well, and I have to say that I appreciated the focus on female characters pursuing their own dreams, by-and-large. It's a shame, ultimately that our four leads get used to catalyze the plot (or for comic relief) more than they get any development, and it's telling of this show's weaknesses when, around episode nine, we begin to focus on their personal drama and the show immediately gets boring again. Watching the four of them squabble isn't entertaining or satisfying because their character traits aren't defined beyond the basic roles in an ensemble cast, with Nozomi basically being a MacGuffin to, say, Ai's depiction as a lazy and constantly-voracious freeloader (given that she doesn't drive her own bike). And if you hoped that the four would indeed find their purpose while out on the road, forget it: the side characters' arcs are wrapped up nicely, but at the very end, Masami and the bandit (who now have an uneasy alliance) re-enter the picture to fight off an alien invasion from the future, making Nozomi and company's role basically irrelevant. It's just a bad way to end the series. The emotional drama is forced, it's a stale and tiresome plot twist, and it's of questionable relevance to anything else in the rest of the show. In my opinion, The Rolling Girls would've been better off investing more in the main cast and giving their character arcs some closure, or for that matter, giving them character arcs at all. Instead, we have a melodramatic ending that's full of explosions but light on substance and far too stupid to be taken as seriously as the show wants it to be. It's as if The Rolling Girls wanted to be a zanier and more psychedelic Kino's Journey, but then changed course and decided that it would pull a Tsuritama by taking a fine show with a laid-back pace and ruining it with an alien invasion. And so I feel the same way about The Rolling Girls as I do about that show: it's hard to recommend because of its laughably messy attempt at Earth-is-in-danger drama during the last act. But The Rolling Girls is even harder to recommend because the first two episodes really are such a discouraging slog. If you really do want to watch this show, I'd say work through the opening episodes for what context they do provide, continue through the more enjoyable sequence of silly-but-enjoyable arcs, and that completionists aside, don't bother with episodes nine and beyond. There's a good show in here, but it really takes a lot of work to separate the grain from the chaff and see that. Recommended Audience: It's a fairly tame show, whose violence is generally cartoony (i.e. nobody gets killed or even badly hurt) in spite of the degree of seriousness with which its characters take the fights. One of the main characters basically wears a bra and daisy dukes (with a jacket not quite covering everything), but there's not much fanservice besides that. Version(s) Viewed: Stream courtesy of FUNimation, Japanese with English Subtitles.